Riding All-Terrain vehicles is a fun activity for adults and children alike. It is a great hobby that gives family, kids, and friends a great way to bond. Whether for fun or sports, ATVs offer a great opportunity for adrenaline filled outdoor playtime and this is what Peg Perego seeks to boost. 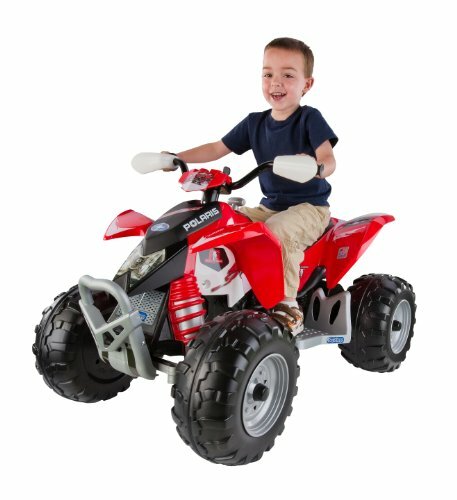 Over the years, it has committed itself to make ATV riding fun for adults and children alike by introducing riding toys for younger children who would otherwise not be able to safely ride adult-sized ATVs. Here is a review of the award-winning Peg Perego Polaris Outlaw. Peg Perego is a producer and designer of children’s products and kid-sized riding toys. The company specializes in hyper-realistic children’s toys with a primary focus on top durability and safety. 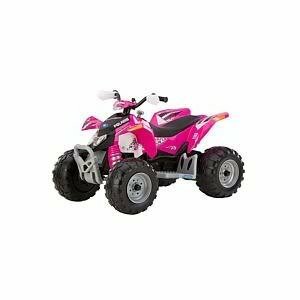 Its ATVs come in attractive colors appealing to both boys and girls. In short, Peg Perego brings excitement to children outdoors with toys that are made to last. The Peg Perego Polaris Outlaw makes ATV riding fun for children aged 3 to 8 years. It moves at 2.5 miles an hour but kids can use its two-speed gear shift to initiate high-speed adrenaline adventures at speeds of up to 5 miles per hour. It is reputed as one of the cleanest, safest and most exciting rides among toys. Knobby wheels that provide reliable traction on varying surfaces making the transition from grass to dirt, or pavement to gravel smooth. Lockout features to ensure safe driving for small children and beginners. Two-speed gear shift offering driving options in 2.5 miles per hours and 5 miles per hour; the ATV also features a reverse mode. Realistic fenders, shocks, and other vehicle accessories. Smart pedal technology that allows for simple operation for learning drivers; the smart pedal is foot operated and minimizes jerky driving while increasing riding time as it saves battery power. 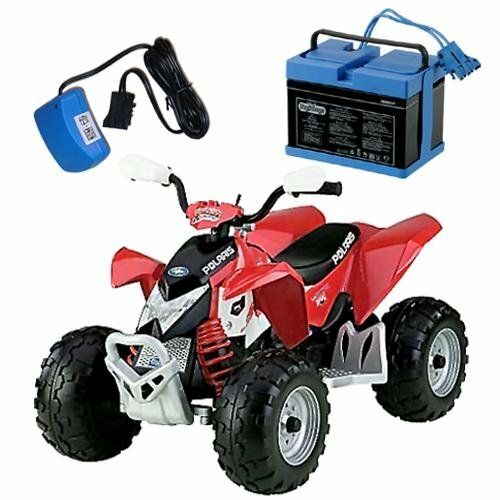 A 12-volt rechargeable battery that delivers kid-friendly power; it is quite zippy and powerful; the ATV comes with a charger. The automatic brake system improves safety and can be controlled by wireless remote; this feature enables the parents to keep an eye on the child and stop the vehicle at the touch of a button when deemed necessary. Brush guards and a passenger seat hence can accommodate two children at once. Ability to support up to 85 pounds in weight. An attractive Polaris design coupled with flashy accents keeping the little cruiser looking appealing. A rugged frame that ensures the ATV is able to cope with all the off-road and rugged terrain action. Peg Perego Polaris Outlaw is fitted with a smart pedal certified engine and high-performance motors that are guaranteed to work well even under poor driving conditions such as the hot summers, cold winters, and under the rough terrain. Its rear drive wheels are powered by independent motors to increase performance. The Polaris Outlaw has a lot of technological sophistication together with a grown up and sporty look that adds much to the riding experience for boys and girls alike. The battery-powered four-wheeler is guaranteed to keep running strong even longer after the children have outgrown it. Within its category and price range, Peg Perego Polaris Outlaw shines. We fully recommend it. It’s a kid’s ATV no other manufacturer has been able to match. Well… Razor ATV is the closest.